A couple of months ago we discussed the SBIC program, a government initiative that provides leverage to mezz funds focusing on small business lending (see post). Attached is the SBIC 2012 annual report with some interesting data. 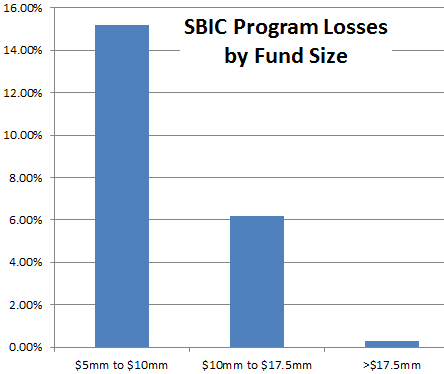 One result that stands out is the contrast in long-term performance between smaller SBIC funds and the larger ones. Typically an SBIC fund will lend to maybe 15-20 companies. If investors put $20 million into the fund and the SBA lends the fund another $40 million, that the fund has $60 million to put to work. That means that such a fund will typically provide $3-4 million dollar loans to each of the portfolio companies. A $5 million fund on the other hand would provide $750K - $1 million dollar loans (roughly). 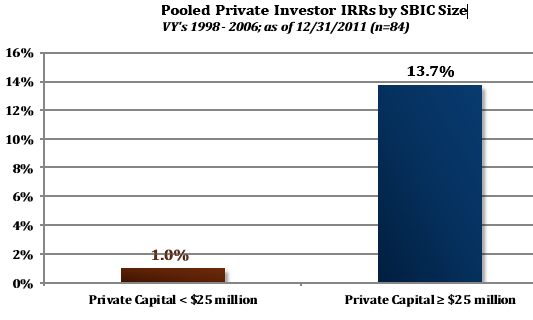 It turns out that lending to the "larger small companies" is far more profitable than to the really small ones. The loss ratio (the percentage the government lost on it's loans to these mezz funds) due to defaults is almost negligible for funds that are above $17.5 million, but increases sharply for smaller funds (that provide smaller loans to smaller companies). Similarly the annualized returns (IRR) are quite good for the larger funds, while one barely breaks even with the smaller funds. The data above covers funds launched between 1998 and 2006. Keep in mind these are finite-life funds. A fund will typically invest for the first four years and then all the realizations are returned to investors over the next few years. The 2004-2006 funds did a great deal of their investments prior to the financial crisis but had to get their money back after the impact of the downturn. The data therefore includes the full impact of the Great Recession. The results indicate that small business lending with government leverage can in fact be quite profitable (across different points of the economic cycle), as long as these mezz funds stay away from the really small firms.